I don’t think I’ve ever had a deviled egg I didn’t like. I’m not claiming to have tried hundreds and hundreds of variations or anything but I have had a lot. If deviled eggs are on a buffet table, you can bet there are some on my plate. If they appear on a menu, I (or my husband) would be ordering it. They’re comforting and classy. It’s also really fun to play around with all the possible ways to top deviled eggs. I was recently introduced to a few new toppings when I got to enjoy a brunch tasting with the Houston Food Blogger Collective at Liberty Kitchen Garden Oaks. They offer deviled eggs with several choices of toppings including fried oysters and smoked salmon but the deviled eggs with bacon jam were my favorite. Liberty Kitchen offers brunch only on the weekends. Fortunately, they offer deviled eggs all week long. 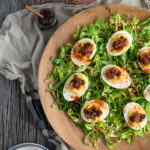 Needless to say I was thrilled when Lance Fegen, culinary director and executive chef, shared the recipe for his deviled eggs with me. When I read the recipe and saw that his instructions ended with “feel free to add things like bacon jam, pieces of bacon, … fried ‘stuff’ as topping”, I knew he and I spoke the same food language. Chef Fegen believes in food that is creative yet approachable and family-friendly. The menu at Liberty Kitchen Garden Oaks offers something for everyone. The atmosphere of the restaurant feels the same way (no doubt, by design). It’s hip and eclectic yet inviting and comfortable at the same time. You can come here for family brunch just as easily as you could for date night. We dined in the area off the main dining room which has sliding glass doors that can be closed for private parties or left open for regular seating when the space isn’t being used for a party. The cocktail menu reflects the restaurant’s same vibe – lots of options, lots of fun. There’s the classic mimosa for those looking for something traditional and there’s also the Bloody Mary cart that allows guests to customize their cocktail with several choices of add-ins. I chose the West Candlelight, a cocktail made with vodka, crushed raspberries, St. Germain, and fresh grapefruit. It was everything I look for in a good vodka cocktail – fruity without being overly sweet. The choices didn’t end with the drinks. We got down to serious eating with a sampler of several appetizers which included deviled eggs topped four ways, some Chesapeake crab balls, and a shrimp cocktail topped with fried oysters and avocados. The deviled eggs were delicious but the shrimp cocktail was a close second. The side of their creamy mac & cheese can’t be overlooked either. The entrée choices included red velvet pancakes, frosted flake French toast, Dixie fried chicken sliders, and the real cowboy surfers donut bowl. I have to admit I almost ordered the donut bowl for the name alone. In the end, I opted for the chicken sliders which satisfied my love for cream gravy and potatoes at breakfast. The common theme throughout my experience here was balance. The restaurant interior is playful while being serene. The food is homey while being elegant. The vibe is trendy yet classic. It isn’t easy trying to be all things to all people but Liberty Kitchen Garden Oaks makes a really good go of it. Note: I was invited to attend a tasting at the restaurant as a member of the Houston Food Blogger Collective. All food and drink were provided by Liberty Kitchen Garden Oaks. As always, all opinions are my own. Fill a large saucepan about half-way up with cold water. Stir in a few generous pinches of salt (the salt makes peeling the eggs easier). Gently put the eggs in a single layer in the saucepan and add enough additional cold water to cover by 1 inch. Bring water just to a boil over high heat. Remove the pan from the heat, cover and let stand for 13 minutes. Then rinse the eggs under cold water until cool enough to handle. Crack the egg shells and carefully peel under cool running water. Gently dry with paper towels. Slice the eggs in half lengthwise, removing yolks to a medium bowl, and placing the whites on a serving platter. Lightly mash the yolks with the tines of a fork. Add the pickles, mayonnaise, mustard, and hot sauce. Stir until evenly mixed. Season with salt and pepper to taste. Transfer the egg yolk mixture to a small ziploc bag. Snip off one corner of the bag and pipe some of the filling into the openings of the egg whites. Spoon about a 1/2 teaspoon of bacon jam on each egg half and top with crumbled bacon. Dust eggs with paprika and serve. Recipe courtesy of Chef Lance Fegen. For those in Houston, the bacon jam is available at Central Market. When you say “the bacon jam is available at Central Market,” I am assuming you mean the Terrapin Ridge brand yes? Dumb question. I am a little disappointed to find out though that one of the ingredients for the LK bacon jam is….bacon jam. I was hoping to learn to do it from scratch! Oh well, as long as it tastes like the deliciousness at LK, I’ll take it! Yes. The Terrapin Ridge brand is available at Central Market. I know what you mean by not having the recipe for LK’s bacon jam but they didn’t share that part of the recipe with me. The deviled eggs are still quite good with the Terrapin Ridge though. I hope you like them.